The former SA president did nothing for his people, and was a hero of a circumstance, according to the poet. Following the death of Cuban president Fidel Castro, South Africans, including political parties, have taken to social media to celebrate him, with the majority hailing him as a hero. However, white people apparently hate the late president because he was a black hero, according to poet Ntsiki Mazwai. The poet took it further and compared Castro with former president Nelson Mandela, who she says was not a hero. 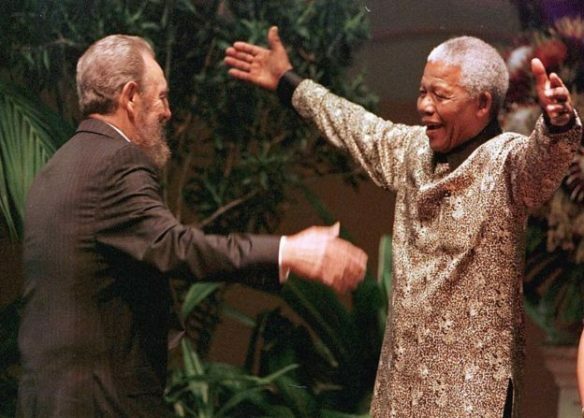 “Fidel Castro > Nelson Mandela,” she tweeted. She said the former president did nothing for his people, further calling him a hero who just happened to be the right man in the right place at the right time. Her opinion left fans divided, with quite a few disagreeing with her. One follower said what Mandela had achieved depended on which side of the pie one was on, and the same could be said for Castro. “Pity the cost of freedom escapes you, yet you enjoy the privilege of being free. Know your enemy, don’t confuse yos [sic],” said another. Another who disagreed with Mazwai’s sentiments said Mandela had sacrificed his life to join the struggle to fight for the country. “He could have continued as a lawyer enjoying his life, but took up the struggle, hurting his marriage, life & all,” he said. However, the comment did not hold much weight, according to the poet, who said thousands of black people made the same sacrifices too. “Let’s see you spending 27 days in jail at least for others before you come insult Mandela and his team. mxm twitter guru,” the follower continued. However, Mazwai urged the user to “know your history”, as there were “real” apartheid heroes who were still in prison. One who agreed with her said the former president “left us with Apartheid criminals with all the privileges, unpunished and untouched”. Mazwai has never shied away from expressing her opinions on the late president, who she says is not her hero. In fact, according to her, the real hero is his ex-wife, Winnie Madikizela-Mandela, who is not celebrated enough.